We waited a long time for my sons front tooth to finally come out – it spent the last week sticking horizontally out of his mouth – in a “Nanny Mc Phee” kind of fashion! Finally, last week, it did come out and there was great salutation and rejoicing – from me anyway. With suitable formality and ceremony the said tooth was placed in the very special “tooth bag” that we have for such occasions and carefully placed under his pillow. As I lay with him that night we chatted about all things “toothy” and just before I kissed him goodnight he threw me one of his wonderful questions…..
Look at that for a smile! Well, where do you start with that one? I hummed and hawed and spluttered and muttered some kind of an answer (which of course was countered and refuted) and beat a hasty retreat. The next day we went to visit family only to be met by another toothless smile from my lovely nephew. So naturally teeth were a hot topic of conversation for the weekend, so much so that my brother suggested they become the topic of my next blog. Not terribly enamoured with the idea (or should I say “enameled”) I changed the subject. However, the seed had been sown and the idea rattled around in my head for a few days. Today I have been chatting with my brother again, he has his own tooth woes this week with a few trips to the dentist and a tooth that didn’t fall out naturally. So, I figure I owe it to him….this ones for you Bro! In for a penny-in for a pound… I guess I may as well keep my own son happy too and consider his question, so teeth and nails and the science there-of…although I make no promises on the whole “nail fairy” thing! WHY DO CHILDREN LOOSE THEIR “BABY” TEETH? When teeth begin to grow in a baby’s mouth the gum and jaw are not developed enough to allow for extensive roots to form under the tooth and so smaller, weaker roots are formed on these early teeth. By the age of (usually) six or seven the jaw has matured to a point that allows it to hold adult teeth- and their larger roots- securely. The smaller baby teeth start to get loose at this stage and fall out. Cue the “Tooth Fairy”! WHEN DO BABY TEETH START TO FORM? Baby teeth start to form when the baby is still in the womb, in fact the first part of their production begins when the fetus is only four weeks old. Once the baby is born the teeth usually start to push through the gum any time from about six months on. However there are exceptions to this – some babies are born with visible teeth – these are called natal teeth. Teeth sometimes appear within the first month after the baby is born and these are referred to as neonatal teeth. The full compliment of 20 baby teeth are usually all grown by age three. Baby teeth usually fall out in the order in which they first appeared! Babies who get their teeth later than most will usually start to loose their teeth at a later stage too. This is certainly true in our house… my daughter finally cut her first tooth at the age of 11 months and lost her first baby tooth at the age of eight! HOW LONG DOES THE “LOOSING BABY TEETH” PHASE LAST? Loosing baby teeth and growing new ones usually takes six or more years. The new adult teeth tend to be less white than baby teeth, often appear very large in the child’s mouth (at first anyway) and usually have noticeable ridges on them (that is because they have not been worn down from chomping and chewing)! Adult teeth do not actually push their predecessors out of the gum. Instead a group of cells called odontoclasts form between the root of the baby tooth and the tip of the adult tooth. These cells are responsible for absorbing the roots of the baby teeth, leaving them without their anchor in the gum. 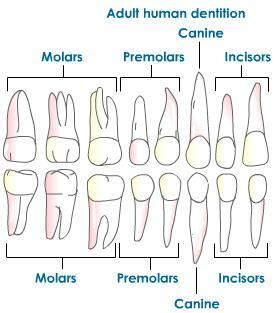 HOW MANY ADULT TEETH DO WE END UP WITH IN TOTAL? The 20 baby teeth are ultimately replaced by 28 adult teeth. Then the four wisdom teeth get added, usually in our 20’s, bringing the total number of adult teeth to 32! However it is common for some, or all of the wisdom teeth to be completely absent from an adult. This may happen if the jaw is not big enough to accommodate the extra teeth. I myself got my wisdom teeth very late (and slowly) and only got three of them- I like to think I am wise enough not to need them all – but there are plenty who will argue that one! CANINES (also known as CUSPIDS) are used for tearing. PREMOLARS (also known as bicuspids) are used for tearing and crushing. MOLARS are ideal for crushing and grinding. Teeth have two parts, the top part that we can see, called the crown and the part we cannot see, the root, which below the gum. The root is embedded in the jaw bone. ENAMEL…this is the shiny white part of the tooth that we brush. It is the strongest material in our bodies which makes it ideal for all the cutting, chewing, chomping and grinding that the teeth have to do. This layer contains a lot of calcium. DENTINE… this is the layer just under the enamel. It actually makes up most of the tooth. Although a hard substance it is not as hard as enamel. CEMENTUM… this covers the dentine part of the root of the tooth (below the gum) and helps to anchor the tooth into the jawbone. PULP… this is the inner most part of the tooth. It is the only living part of the tooth, made up of blood vessels and nerves and other soft tissues. Why do we have nails and what purpose do they serve us? Nails are considered a protective layer at the sensitive ends of our fingers and toes. However their function goes well beyond protection, they are also great tools and implements for finer dexterity such as peeling, gripping and scratching. The nail plate- is the part of the nail that we see, made of layers of keratin. Nail folds – this refers to the nail skin around the nail. 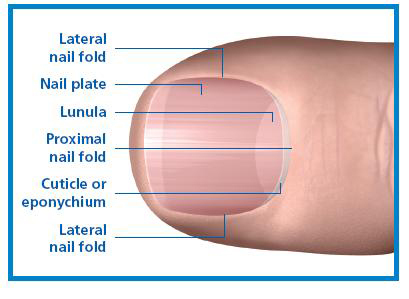 Cuticle – this is the tissue that covers the bottom of the nail to protect the newly formed nail cells. Nail bed – this is the are of skin that is covered by the nail. Lunula – this is the white “half moon” that we see at the base of the nail. Nails do not actually grow from the top of the nail, they grow from the base of the nail, just under the skin. As new cells are made the older cells harden and get pushed out along the nail. Fingernails grown about 3 milimetres per month. Usually fingernails grow faster than toenails. The fingernails on our dominant hand grow more quickly than the nails on the non-dominant hand (American Academy of Dermatology). WHAT CAN OUR NAILS TELL US ABOUT OUR HEALTH? Healthy nails are smooth and uniform in colour. Sometimes our nails get little white spots due to knocks and damage and these usually grow out of the nail with time. Nails may often develop ridges running from base to top, often becoming more dominent with age but these ridges are usually harmless. However notable changes to the overall colour or shape of the nail or surrounding skin can be more serious and such things should always be brought to the attention of a doctor (Mayo Clinic). SO BACK TO THE ORIGINAL QUESTION…. WHY TOOTH FAIRIES BUT NO NAIL FAIRIES? 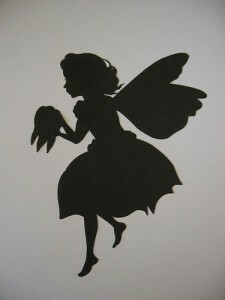 To address the original question of why we have tooth fairies but not nail fairies…. I am still not much the wiser. We could argue the value in a beautiful baby tooth, sparkling and white, full of calcium and minerals … all which might be of interest to the fairies. I really like the suggestion in Rise of the Guardians, that fairies take children’s teeth to guard the memories contained within. When you consider that they are made before we are even born then there is a strong argument to this proposal. But as for nails? I’m not so sure of this one. Most of what we call a nail is actually a clump of long dead cells. You could argue that the fairies might like to collect the Keratin that is found in our nails but this is already freely available from our hair, which we shed a lot of and is easily collected, if the fairies were so inclined! Some say that our toenails are of value as they are the part of our bodies that accumulates any gold, but I can’t find any strong evidence to back this one up. I have to conclude that fairies just do not have any interest in our nails, to be honest I would not greatly blame them, would you? Here is an experiment that can demonstrate to children what fizzy drinks can do to our teeth. Place a hard boiled egg into each of the three glasses. Cover one egg with vinegar, one egg with fizzy drink and one egg with water. Cover all three glasses and leave them like this overnight. Next day remove each egg and record what you find. If you examine the egg in the vinegar you should see that the shell has disappeared. If this is not the case, place the egg back in the glass and leave it for another day. Now look at the egg that was left in the fizzy drink. You should see that the shell has been dissolved away (or at least partially) just like the vinegar. The enamel of our teeth contains a lot of calcium just like the egg. The fizzy drink is acidic, just like the vinegar. You begin to get an idea of what fizzy drinks can do to our teeth if we don’t look after them! Now check the egg that was left in water, it should still contain a strong shell, the water should not have changed it!